Ms. Tanya Chisholm, Ms. Amanda Hollowell, Ms. Nashia C. Whittenburg, Ms. Karen Bogans, Ms. Monifa I. Johnson, Ms. Beverly M. Hall, President, Mrs. Angela B. Young, Vice-President, Mrs. Chanté L. S. Frazier, Mrs. Vanessa Kaigler, Mrs. Wanda S. Lloyd, Dr. M. Ann Levett, Dr. Mary B. Chatman. 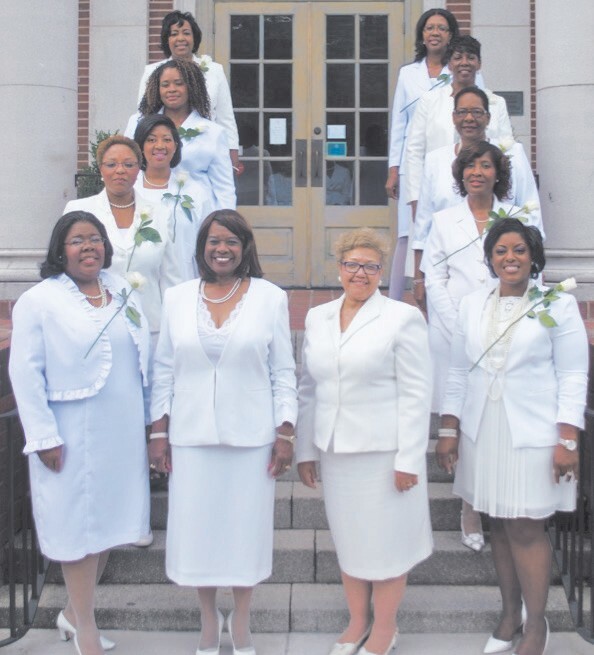 The Savannah, Ga Chapter of The Links, Inc. inducted ten dynamic, community minded women on Saturday, June 6, 2015 at Cohen’s Retreat in Savannah, Ga. The chapter’s new members are: Ms. Karen Bogans, Training Manager and Communications Oversight-International Paper Company; Dr. Mary B. Chatman, Chief Operating Officer and Chief Nursing Officer- Memorial University Medical Center; Ms. Tanya Chisholm, Assistant Manager, Human Resources Georgia Ports Authority; Ms. Chante’ L.S. Frazier, Board Certified Medical Physicist-Memorial University Medical Center; Ms. Amanda Hollowell, Education Specialist-Life- Link of Georgia; Ms. Monifa I. Johnson, Grants and Procurement Administrator Housing Authority of Savannah; Mrs. Vanessa Kaigler, Chief Facilities Management and Support Services-Savannah Chatham County Public School System; Dr. M. Ann Levett, Chief Academic Office- Savannah Chatham County Public School System; Mrs. Wanda S. Lloyd, Chair and Associate Professor, Department of Journalism and Mass Communications-Savannah State University; and Ms. Nashia C. Whittenburg, Director, Office of Multicultural Affairs-Armstrong State University. These distinguished women, who are all individual achievers, have made a difference in our community and nationally. They now join the influential decision makers and opinion leaders of The Links, Inc. – further demonstrating their commitment to service in our community, nationally, and globally.